Jan Müller-Wieland has composed a new melodrama. 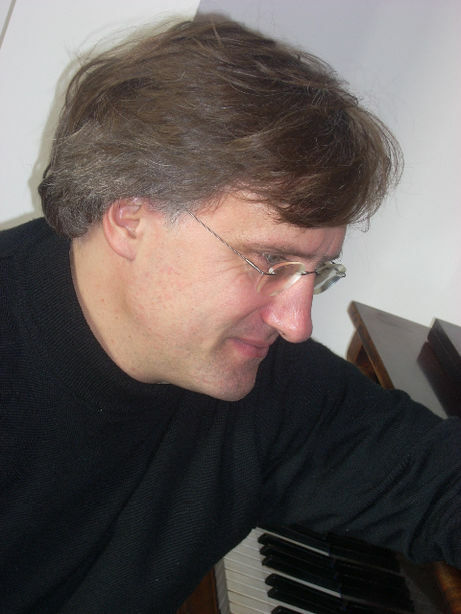 His new work "Maria" will be premiered on 23 September 2018 in Essen. The work, commissioned by the Office for International Cultural Projects in cooperation with the Ruhrtriennale, will be interpreted by the Balthasar Neumann Choir and the Cuban-European Youth Academy Orchestra under the baton of Thomas Hengelbrock. The former chief conductor of the NDR Elbphilharmonie Orchestra has intensified his work with young Cuban musicians parallel with his activities with the Balthasar Neumann Ensembles. The speaker parts of the melodrama take over Hengelbrock's wife Johanna Wokalek and Peter Simonischek. "Maria" originally refers to Godard's short film "Je vous, salue Marie" and Saramago's novel "The Gospel according to Jesus Christ". "Maria distrusts the Archangel Gabriel. She loves her Josef. This one has to go to town. Jesus is born. Joseph is crucified. Maria flees with her baby in front of the Roman minions to the sea. She can not swim but risks escaping. In 1985 I saw in the cinema 'Je vous salue' Marie 'by Jean-Luc Godard. In this film the biblical love story is transformed into our everyday life. Josef is a car mechanic, Gabriel a customer at his gas station. In 1998, I read Saramago's novel, "The Gospel According to Jesus Christ." In this book, Joseph is crucified - as one of many, more or less as a resistance. Jesus has a traumatic survival syndrome. When I returned home in 2015 after a meeting with Johanna Wokalek, I had to go to a supermarket in the early evening. At the cash register, an unnerved cashier said: 'Two ninety please! Thank you. This box office is now closed. Ciao boss. I pack. Happy end of work. 'This word is exactly the same in the play. Thus, Maria (Johanna Wokalek) was a cashier, who probably witnessed the Gospel story in a dreamlike way. But Josef remains the silent carpenter, who bravely and defiantly - in opposition to the Roman rule - builds a house for Maria and himself, for he knows or suspects: 'Who now has no house, no longer builds himself.' This sentence is from the autumn poem Rilkes. In other words: Along the story, references, connotations, hints, excursions, branches to other elements of our cultural consciousness have arisen. The piece is a sort of melodrama oratorio, the choir figures as a holy spirit. Thomas Hengelbrock suggested that he occupy the orchestra as well as Schumann in his Faust scenes. Therefore, there is no drums. No jewelry! Only timpani! Bach's royal theme, the theme regium from the 'musical sacrifice' has spurred me on writing all the time. When Maria refuses to be Gabriel (Peter Simonischek), it appears for the first time audible. It is her star. Your soul. Your whereabouts. " In Pasolini's Jesus film of 1964, the theme of regula- tion is Judah's tormenting conscience. Why? Because of the music, the simple sound sequences. Man is full of love, but an abyss.